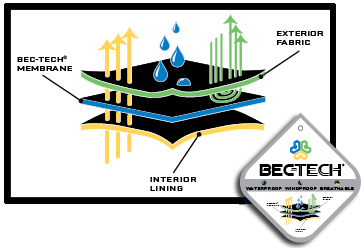 Bec-Tech® is Becker Gloves' very own revolutionary barrier designed to be waterproof, windproof and breathable. This high-tech membrane is sewn between the outside layer and the inside lining to repel the outside elements like wind and water while also wicking and evaporating perspiration from the inside keeping you warm and dry. You can rest assured that any glove, hat or mask made with Bec-Tech® will provide you with a high level of comfort and protection against the elements. 3M™ Thinsulate™ Insulation is used in jackets‚ pants‚ gloves‚ hats and boots to help keep you warm when it’s cold outside. The unique microfibers or fine fibers that make up Thinsulate™ insulation work by trapping air molecules between you and the outside. The more air a material traps in a given space‚ the better it insulates you from the cold outside air. 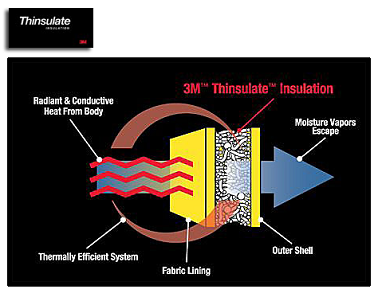 Because the fibers in Thinsulate™ insulation are finer than the fibers used in most other synthetic or natural insulation‚ they trap more air in less space‚ which naturally makes Thinsulate™ insulation a better insulator. Stay comfortable and connected with your touchscreen device. Ultra-fine conductive thread allows for pinpoint accuracy while maintaining it's flexible and soft feel. TechTouch gloves can be used on phones, tablets, GPS devices, e-readers, ATM's, gas pumps and more. Our waterproof technology is a barrier sewn in-between the glove layers to keep the moisture from soaking through the glove fabric and making your hands cold and wet. Dry hands are warm hands, and our gloves with waterproof technology will keep them that way! 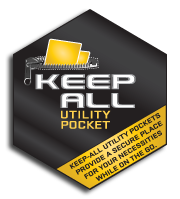 Many of our gloves feature a KeepAll utility pocket that is perfect for individual hand warmer packets or a place to stash keys, cash or lip balm. It's a secure place for your necessities while on the go.